Albany cleanroom high speeds doors protect against drafts, humidity, dust, and dirt. The ASSA ABLOY is the leading cleanroom door manufacturer. It delivers Albany cleanroom doors perfected for controlled environments. Our cleanroom doors feature an almost airtight seal, which minimizes pressure drops and protects your environment against drafts, humidity, dust, and dirt. These advanced high speed doors are ideal for cleanroom and associated controlled environment applications in pharmaceutical, chemical, electronics and micro­ mechanics industries. 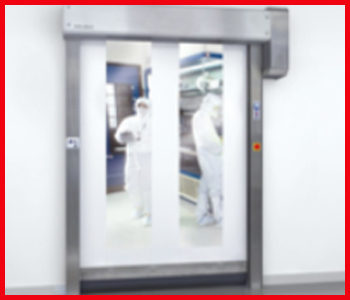 The Albany RR300 Clean high speed cleanroom doors help to minimize contamination risks and meet hygienic standards for controlled environments without compromising product quality or worker safety. This high speed door has exceptionally fast speeds, near airtight seals and durable performance provide greater control over particle concentration and air changes while maintaining stringent cleanroom requirements. The requirements include: ISO Class 5 (US Federal Standard 209E Class 100) and GMP Class C.